Today’s ultra-light notebooks, mini, and all-in-one desktop computers now have tremendous processing power—power that many thought would only be possible in full-size workstation or large desktop computers. Smaller in size and more portable, they’re very desirable. For pros in the creative fields, processing power alone is not enough. A prime example is the latest Mac Pro®. Reviewers love its performance, but make a point of mentioning its lack of internal expansion capabilities compared to the old towers the new model replaces. If you want to add more capabilities, think external—the latest Pro is loaded with Thunderbolt 2 and USB 3.0 ports, but it lacks the PCIe expansion slots necessary for you to install specialty high bandwidth NIC cards, or HBAs and RAID controller cards for high-performance storage. With the Echo Express SEL, Sonnet has created a solution that leverages the paradigm shift enabled by Thunderbolt technology, allowing PCIe expansion slots to be connected outside a computer. This very compact desktop Thunderbolt 2-to-PCIe card expansion chassis is ideal for connecting one professional 16Gb or 8Gb Fibre Channel, 10 Gigabit Ethernet, SAS/SATA host bus adapter or RAID controller PCIe card to any Mac® or Windows® PC(4) with a Thunderbolt port. The Echo Express SEL features Thunderbolt 2 technology, which provides ample bandwidth for many of the most demanding, highest performance PCIe cards, and incorporates support for the DisplayPort 1.2 protocol, which enables video streaming to a 4K video monitor. While the SEL delivers maximum performance when connected to a computer with Thunderbolt 2 ports, it is also fully compatible with computers with 10Gbps Thunderbolt technology, supporting most cards at full-performance. The Echo Express SEL is small, light, and perfect for use in situations where only a single low-profile PCIe card is needed. Measuring a scant 4" wide by 8.4" long by 2.8" tall, the SEL was designed specifically to house one low-profile PCIe card. Many of the most popular Thunderbolt-compatible high-speed networking and storage controller cards are a perfect fit and even the BlueFish 444 Epoch 4K Neutron video card can be accommodated. The SEL’s small size doesn’t limit its performance; installed in this system, a card will perform the same as when installed in an Echo Express SE II, Echo Express III-D, or Echo Express III-R. And like the other Echo Express models, the SEL includes two Thunderbolt ports to support daisy chaining of up to six devices from a single port on your computer. Constructed of rugged and lightweight aluminum, the outer shell of the Echo Express SEL securely protects the installed PCIe card. The card is protected inside, too. Instead of using a fixed speed fan that may not reliably cool a hot-running card, or a fan with a switch that leaves it up to you to guess the correct speed, the SEL employs a variable-speed, temperature-controlled fan to ensure the card and chassis’ components remain reliably cool. The SEL’s fan automatically speeds up as necessary to cool the installed card when it’s hot, and slows down when it’s cool. Since Echo Express products automatically power on and off with your computer, there is no power switch on the chassis, ensuring you don’t waste energy by forgetting to turn it off. The Echo Express SEL was designed to be ultra-quiet so that it can be comfortably used in noise-sensitive environments. The airflow path within the chassis has been specially designed to enable the temperature-controlled, variable speed fan to quietly and efficiently cool the installed card at all times, even during peak operation. The SEL is Sonnet’s quietest expansion chassis yet. The Echo Express SEL supports one half-length (up to 6.6" long), low-profile, single-width PCIe card. PCIe 1.1, PCIe 2.0 and PCIe 3.0 cards are supported. Do you have a card in mind but aren’t sure it’s compatible? We’ve worked closely with PCIe card manufacturers to provide a list of compatible cards on our supporting PCIe Card Thunderbolt Compatibility Chart. The chart provides an up-to-date list of cards that have been tested to be recognized over a Thunderbolt connection and compatible with Thunderbolt technology requirements. These Sonnet solutions support daisy chaining of additional Thunderbolt technology-enabled peripherals such as an additional Echo Express, the Apple® Thunderbolt Display, video capture devices, and data storage devices. For connected devices requiring extra power, 10 watts is provided through the daisy chain port to peripherals. Sonnet includes a Thunderbolt cable to connect the Echo Express SEL to your computer, and a ThunderLok Thunderbolt connector retainer clip(3) to secure the cable to the Echo chassis. Thunderbolt connectors are held in place by friction, which works well in situations where equipment remains undisturbed while operating. But when there’s a chance of movement nearby, there’s a chance the Thunderbolt cable can be unintentionally unplugged, possibly leading to loss of your work or data. Sonnet’s ThunderLok prevents accidental cable disconnections from the Echo chassis, and is easy to install and use—just slide it over one end of the cable, and then plug in the connector and secure it to the chassis by turning a thumbscrew. Because of its unique design, ThunderLok does not attach to the connector, but remains on the cable so it won’t get lost when not in use. Whether noisy PCIe card fans make it impractical to use the Echo SEL in a noise-sensitive environment, or because securing it in another room is required, you may find it necessary No problem! Optical Thunderbolt cables, available in lengths up to 60 meters, enable you to locate your equipment where you need and connect the pieces without loss of functionality. Sonnet works closely with the following partners to ensure Thunderbolt compatibility for their products. See the PCIe Card Thunderbolt Compatibility Chart for an up-to-date list of products that have passed Thunderbolt compatibility testing with Sonnet products. PCIe cards and computer hardware shown in photos for illustration purposes; items sold separately. 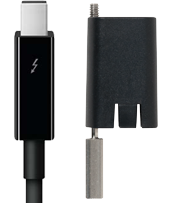 Compatibility requires the installation of Thunderbolt technology-aware drivers, available from the manufacturer. See our supporting PCIe Card Thunderbolt Compatibility Chart for a list of up-to-date compatible PCIe cards. ThunderLok compatible with all copper Thunderbolt cables. Not yet compatible with optical Thunderbolt cables.